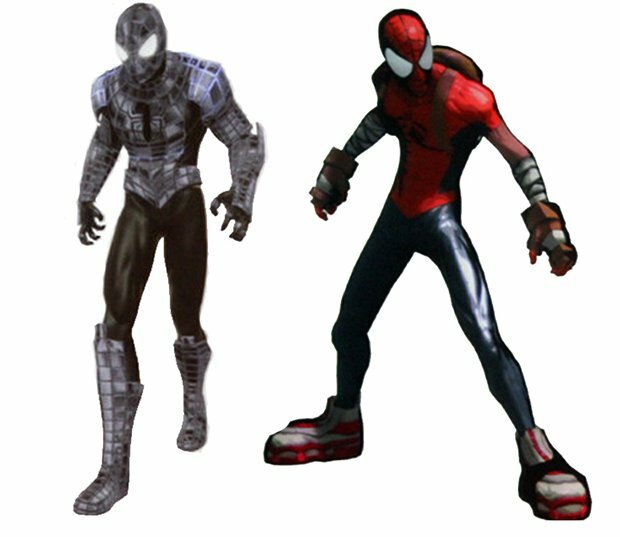 The Negative Zone Spiderman Suit: Spider-Man’s costume turned into this silver-and-black version when he entered the Negative Zone. It allowed him to merge with shadows and become practically invisible in the comics, but don’t expect those extra abilities here. 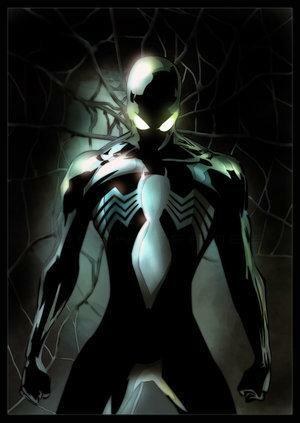 The Black Spiderman Suit from Spider-Man 3: In the third Spider-Man film from director Sam Raimi, the black symbiote attached itself to Peter’s costume, giving it this sleek black look. 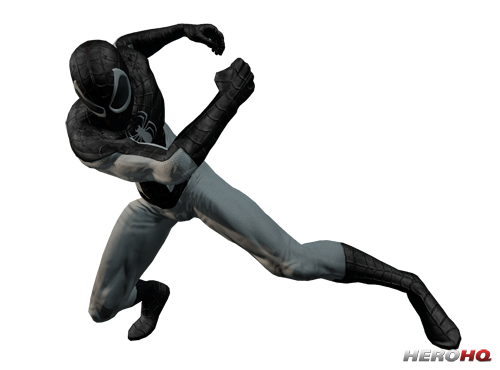 Though most fans would like to erase the film from their memory, the black symbiote suit can be used once it is unlocked. 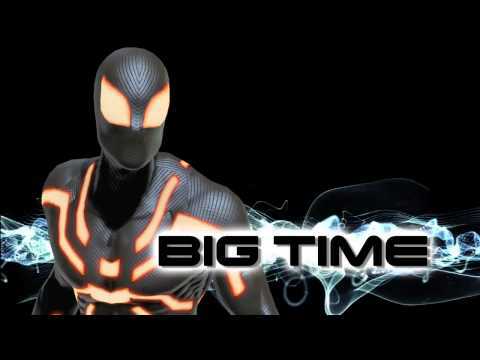 The Big Time Suit: Dan Slott and Humbertos Ramos introduced this neon-green costume for the webslinger during their massive overarching arc, “Big Time”. The Belt-less Spider Man Morph Suit: In Marc Webb’s The Amazing Spider-Man movie, Peter Parker dons a Spider-Man costume without a belt, giving him a long and slender appearance. As the game takes place after the events of the film, Beenox gave the webslinger a belt to keep with the realistic theme. Where else would he store his new gadgets? The inclusion of this costume skin allows players to drop the belt. The Party Hat… Suit: Yea, don’t ask. 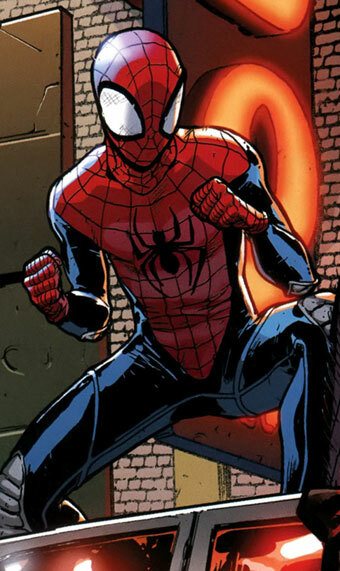 The Vigilante Suit: Before he dons the Spider-Man costume in the film, Peter Parker wanders Manhattan in this “vigilante” outfit. This specific skin is exclusive to PS3. 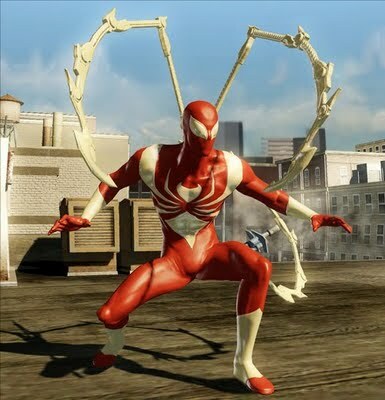 The Scarlet Spider man Suit (Kaine): When Peter’s clone, Kaine, returns after the “Grim Hunt” storyline in the comics, he dons the identity of the Scarlet Spider and wears this awesome red and black costume. It can be seen in the pages of Chris Yost’s Scarlet Spider. The Spider-Morphosis: In The Amazing Spider-Man #437, Spider-Man attempts to rescue the mutant Synch from Plantman, only to be sprayed in the face by mutagenic flowers. Spider-Man’s body was transformed into a humanoid spider, his costume shredded, his hands changed into claws, his face into a spider-like visage, with eight tiny eyes and large fangs and other “gross and humiliating changes”. 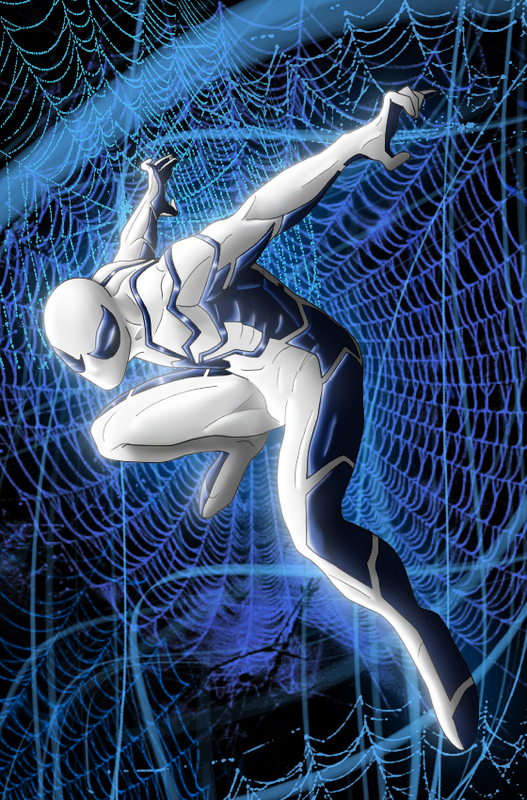 The Future Foundation Suit (Inverted): In the comics, Spider-Man joins Reed Richards’ Future Foundation after Johnny Storm’s apparent death. The team change their costumes from the blue to a new sleek black and white look as the FF. 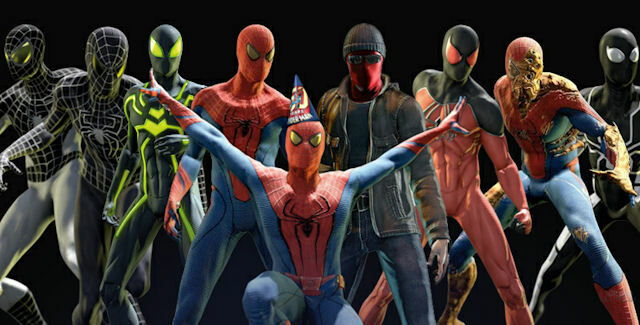 During stealth missions, they went with an inverted version of their costumes, this being Spider-Man’s. In the Marvel Secret Wars series, Spider-Man’s costume was torn during battle and he was sent to a machine that would repair it. Unknown to Spider-Man, the machine was actually a prison that contained an alien symbiote, which copied Spider-Man’s thoughts about the costume worn by Spider-Woman (Julia Carpenter), and created a duplicate of it. During and after the Secret War, Spider-Man learned that the costume could respond to his thoughts, change its shape, and create a seemingly unlimited amount of organic webbing. However, after wearing the suit for some time, he began to feel unusually tired and consulted his friend, Mr. Fantastic. Mr. Fantastic said that the suit was actually an alien creature and that it was taking him web-swinging every night while he slept. Spider-Man then had Mr. Fantastic remove the costume using a sound wave generator, as its only weaknesses are loud sound waves and intense heat, and locked it in a protective case. 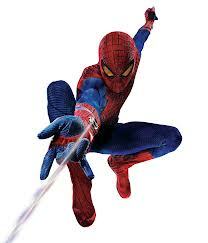 The suit eventually escaped and hung itself in Peter’s closet, disguised as one of his red and blue costumes. Unfortunately, Peter grabbed the symbiote and it reattached itself to him, which forced Spider-Man to use the bells of the Our Ladies of Saints church to remove the suit. 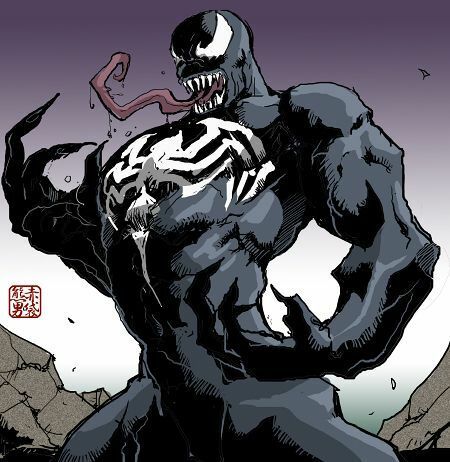 Many issues later, the suit secretly found and bonded to Eddie Brock, who became Venom. From his 1st appearance, Spider-Man wore a costume. 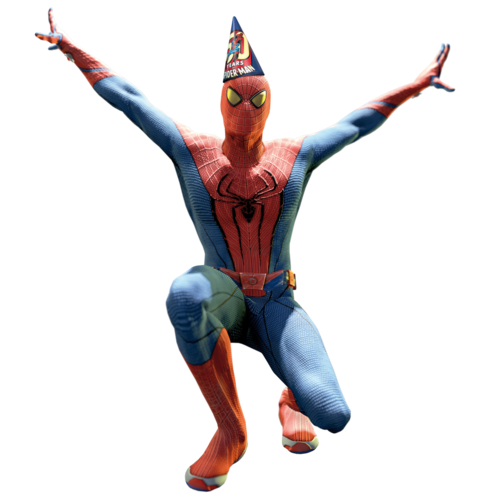 He had a lot of costumes like classic red and blue costume, the black costume, the armor costume, Ben Reilly’s scarlet costume, Iron Spider costume and much more. But, which is the coolest costume of all spider-man costumes EVER? Producers Avi Arad and Matt Tolmach dished that the alien costume symbiote venom will get his own movie while discussing The Amazing Spider-Man. Although it will share the same universe created by the upcoming Spider-Man reboot, yet the two characters won’t share the screen. Tolmach explained to the press that he is trying to get all these worlds live together in peace someday and make sense with one another. This approach could potentially break a lot of fans’ hearts, but at least they want to make a “huge amazing movie” about the beloved character. The movie is a story of Eddie Brock. The producers want it to be as close to the comics as possible, especially in Eddie Brock’s story. But again, pseudo-science is becoming science. All these tidbits about webs, artificial webs, is a huge industry now. Spiderwebs have unique qualities that will be huge for communications, fibers, and so forth. At this point, fans will probably take any incarnation of Venom other than the version they saw in Spider-Man 3. However, it will be pretty cool to see Hollywood make a big budget blockbuster focusing on a character that is typically portrayed as a villain instead of a hero, don’t U think?